There are many types of car owners and many types of cars. To some people their car is their pride and joy, yet to others it is just a means of getting from A to B. Some have high performance cars, and others have normal day to day cars. Some have new cars and others have old cars. 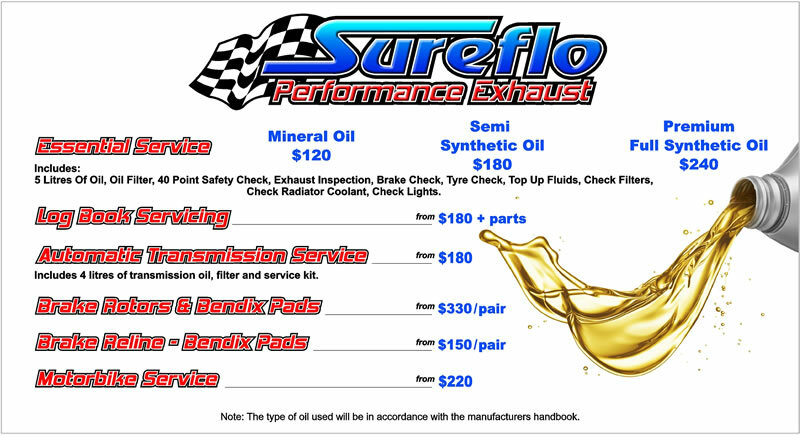 Sureflo cater for all your needs, car types and budgets. Regular servicing is important to the health of your car, and will extend the life of your engine. Regular servicing is important for the safety of you and your family. Often servicing your car becomes the last priority, but if you break down in the middle of no-where and have to get towed, if the engine seizes, if your brakes fail and you have an accident, it can cost you many thousands of dollars in repairs, inconvenience and possibly injury. Repsol oil exceeds manufacturers specifications and is one of the only oils that is actually certified as passing the oil standards. Many oils just say they meet these standards, but are not actually certified as passing. Repsol oil is approved by leading car manufacturers as being suitable for their vehicles and includes such premium brands as Mercedes, VW and BMW. Repsol Oil is legendary in car and motorbike racing and trusted by many champions, so Repsol is a name you can trust, and an oil you can trust, to keep your pride and joy running for longer.